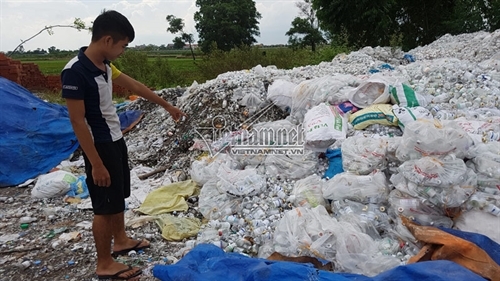 HA NOI – The Health Environment Management Agency (HEMA) has called for an investigation into claims that 10 tonnes of medical waste have been dumped in Yên Phong District’s Văn Môn Commune. HEMA, working under the Ministry of Health, made the request to the northern province of Bắc Ninh’s health department following reports that the provincial environment police had on Tuesday conducted an inspection and discovered Bảo Ngọc Limited Company gathering the unclassified medical waste in the commune without a permit. HEMA asked the provincial health department to clarify the situation and submit a report on it to the agency today. If any violations of regulations on environmental protection in the field of medical waste management are found, strict penalties will be imposed. The company officials failed to present to inspectors any documentation permitting them to treat either normal waste or hazardous waste. They said all the waste had been collected from health care facilities in the province and other provinces to recycle and sell it to other enterprises. Local residents said medical waste started being dumped in Văn Môn Commune several years ago, the online newspaper vietnamnet.vn reported. A truck transported some 3.5 tonnes of medical waste to the dump site every two days, they said. They complained to local authorities many times based on their concerns over water pollution and its effect on their health, but nothing was done to address the problem. Nguyễn Đình Tâm, deputy director of Bắc Ninh Province’s Health Department, told the newspaper that all hospitals in the province had their own on-site medical waste treatment facilities. Thus, the waste might have come from hospitals in other provinces, he said.